Problem child. The Envy 15 is wrapped in an elegant case and equipped with an up-to-date Nvidia GTX 950M. While the specs of the Envy 15 are impressive, throttling has been a prominent problem of our test model. 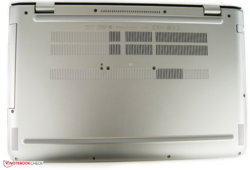 The HP Envy 15 has already been known as a solid all-round device of the upper class for several generations. The good balance of performance, build quality, and case properties were decisive for this success. Now, the graphics unit and case were refreshed. Other than the model we reviewed in March, the test model uses an up-to-date GTX 950M. Beyond that, the inner components remained almost the same. These include an Intel Core i7-5500U, a slightly smaller 8 GB of RAM and a 1 TB SSHD. In this test, we will cover the changes. Please refer to the already reviewed model for further details and tests. Our test configuration is available for about 1000 Euros (~$1130) in the HP Store. We will see, whether the new graphics unit has a positive effect. The MSI GP62 not only houses an Nvidia GTX 950M, too. Thanks to its faster Intel Core i7-5700HQ it is a strong, similarly priced comparison partner. Mostly elegant looking aluminum is used for the case. Plastic is merely used for the underside and the display frame. The case, which looks simple and impressive alike, feels nice to the touch thanks to the chosen materials and rounded corners. 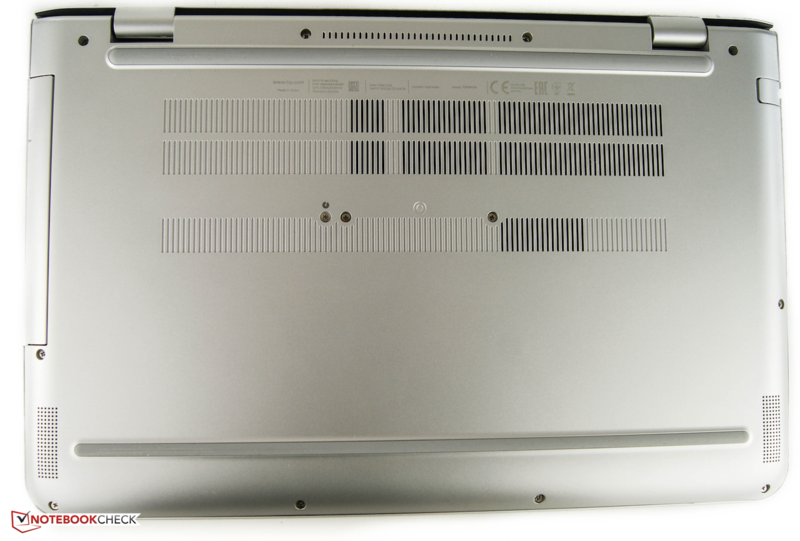 But, flaws can also be detected: For example, the lid and the keyboard unit give way easily when pressure is applied. Otherwise, the case appears solid. 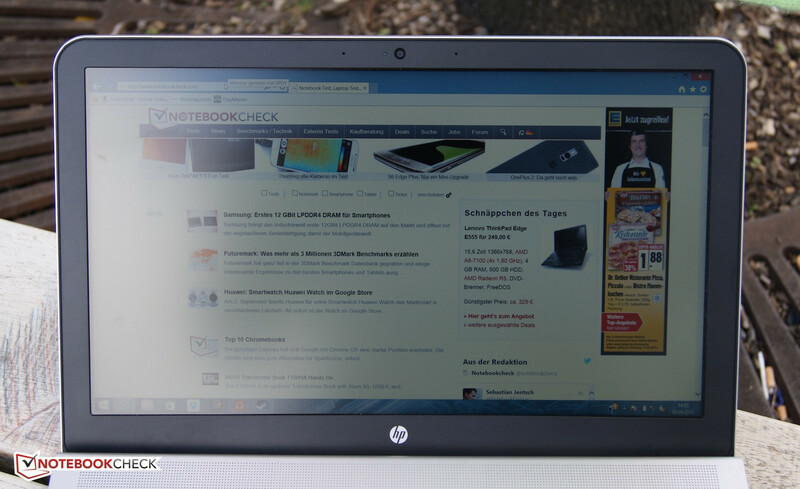 HP implemented a special highlight for heat dissipation: When opening the display, the back part of the notebook is lifted. This also leads to a more comfortable angle for using the keyboard. Next, we tested the performance of the SD-card reader with our Toshiba Exceria Pro SDXC 64 GB UHS-II reference SD card. According to AS SSD the maximum read rate is 86.62 MB/s and the write rate is up to 63.32 MB/s. It takes about 15 seconds to copy 250 JPG files (about 5 MB per image). There are no separate maintenance hatches for upgrades. But, the underside can be removed. The included service guide explains how to do that. 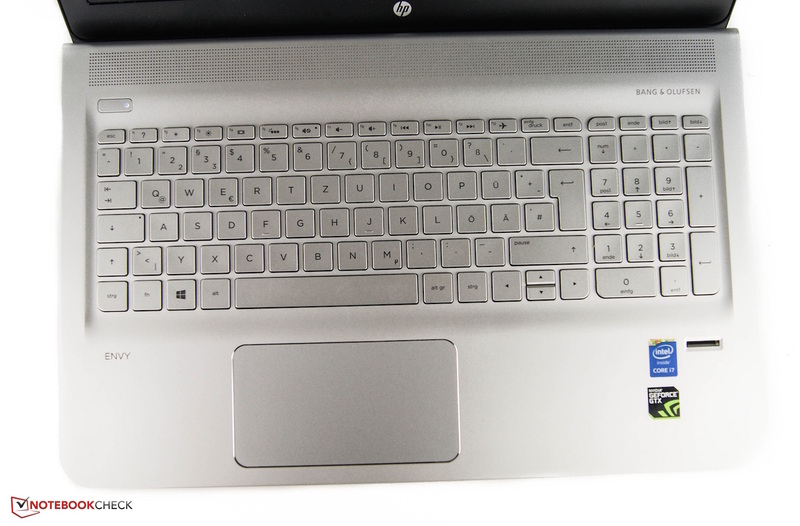 HP's 15-inch all-round device delivers a fully fledged keyboard with number block. In contrast to the predecessor models, the keys of our test model are silver alike the case. The key travel is short with a distinct pressure point, which gives a crispy typing experience. All keys are decently firm and do not yield too much at their edges. Touch typists can type quickly. Only the space bar appears to be a little spongy. Overall, the input device is well-made. The big TouchPad appears to be high-end due to the hidden buttons and the thin chrome edges. Unfortunately, the case clatters during touch inputs. But, gesture control is mostly flawless. Scrolling stutters rarely but is sometimes not immediately recognized. The buttons have a medium travel, which gets shorter towards the center. As usual, input recognition is problematic in the corners. Inputs are only recognized once in a while there. The input device is certainly sufficient for everyday office tasks and web surfing. 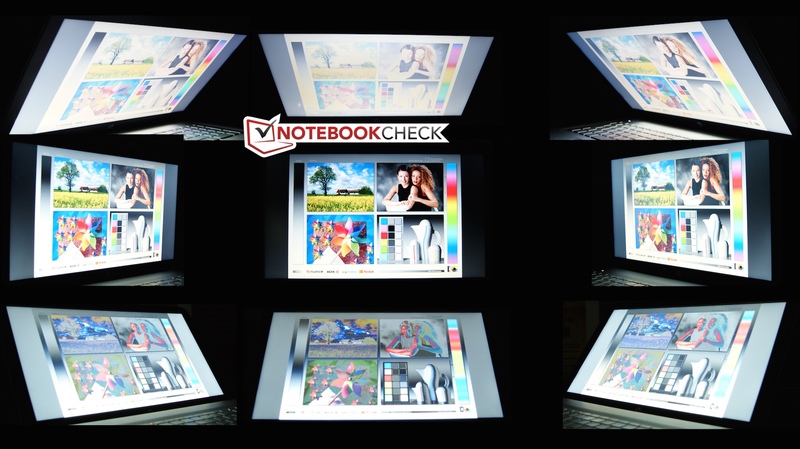 Our 15-inch test model uses a display with a resolution of 1920x1080 pixels. The TN LED panel stems from Chi Mei, while HP still used a display from AU Optronics in the previous model. Many competitors also use a cheap TN panel instead of IPS displays with wide viewing angles. The average brightness is 226.4 cd/m² in mains operation. However, the brightness falls to 192 cd/m² on battery. The contrast of 500:1 is rather average. Several competitors and the predecessor do not perform better, but Acer shows that it can be better with its Nitro. 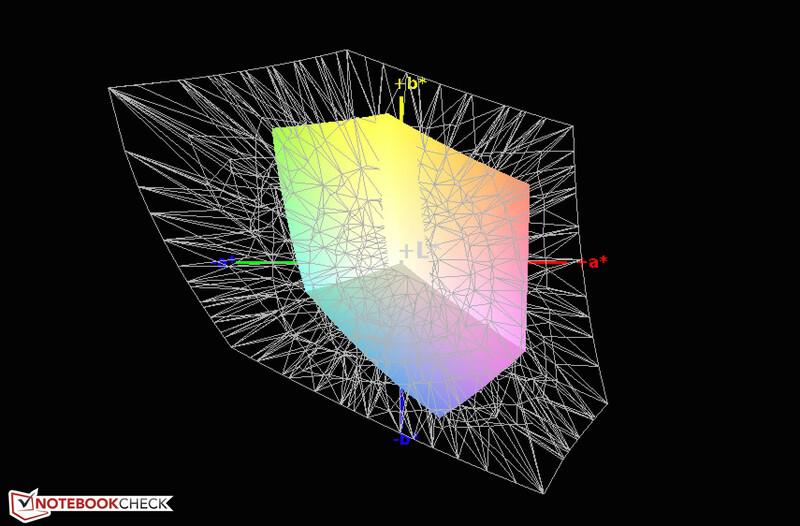 The black value of 0.48 cd/m² is sufficient for a subjectively deep black. A strong blue cast is already visible to the naked eye. This is confirmed by the CalMAN analysis. The deltaE shift of colors and gray levels of above 12 is very high. Several manufacturers include a profile out-of-the-box, which compensates for these deviations. But, this is not the case here. The laptop is not suitable for professional graphics editors. Among others this is because of a color coverage of 38% of AdobeRGB and 59% of sRGB. HP uses a matte display, which withstands direct light sources, in its 15-inch model of the Envy series. Unfortunately, the meager brightness on battery is hardly sufficient for outdoor use in the sun. Thus a shady place is recommended. Since the manufacturer uses a TN panel, the viewing angels are narrow. Colors and brightness are distorted especially when tilting the screen. 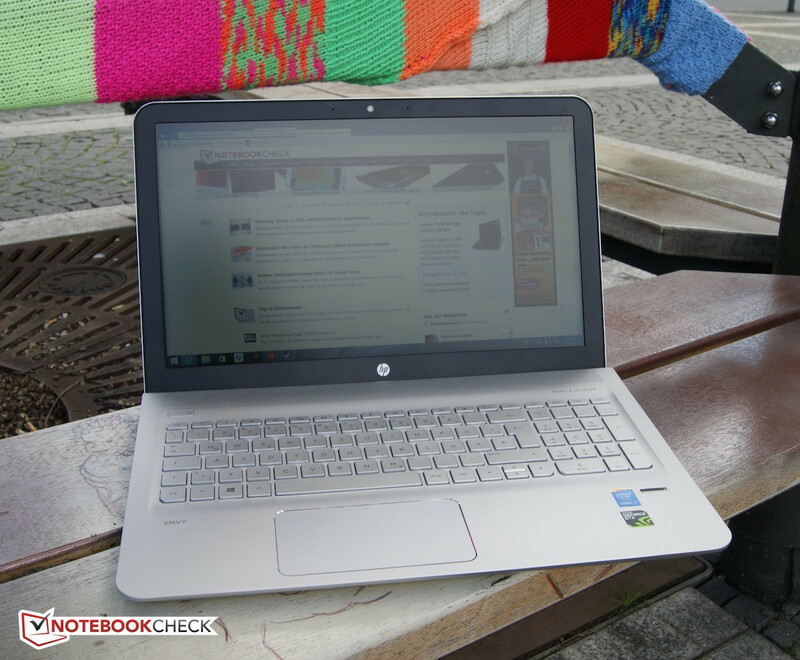 Alike in our previous test of the Envy 15, HP created a well-equipped notebook, which can cope with the usual requirements of everyday computing. Even several games run smoothly without problems. For 1000 Euros (~$1130), the all-rounder comes with an Intel Core i7 processor, a dedicated graphics card and 8 GB of RAM. Variants with other components are currently not listed on the manufacturer's website. The processor remained the same as in the previous Envy 15. HP sticks to a Broadwell CPU. The Intel Core i7-5500U clocks at a base clock of 2400 MHz. With Turbo Boost clock rates of up to 3 GHz (2.9 GHz 2 cores) are possible. 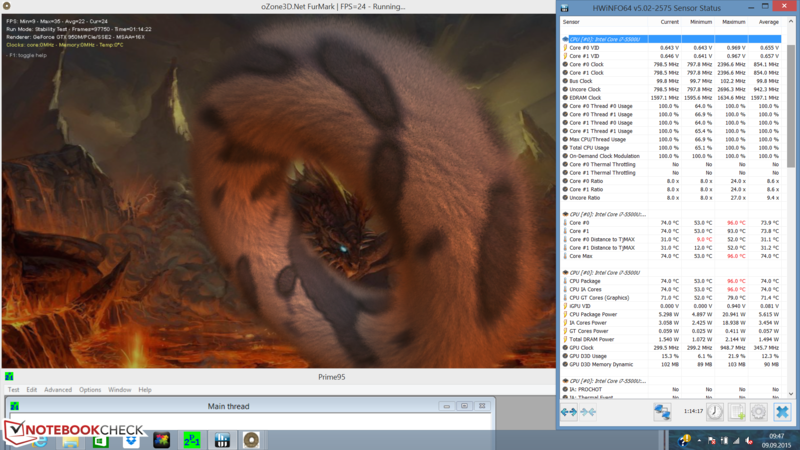 At first, the processor works at 2.9 GHz in Cinebench R15, but, the clock rate quickly falls to 2600 MHz. With about 250 points in the multi-core test, our model performs slightly worse than the already reviewed model. The MSI GP62 performs best in our comparison group with 688 points, but it uses a quad-core chip. After executing Cinebench R15 multiple times, the CPU clocks constantly at 2.6 GHz. We could not observe a performance difference on battery. Our benchmark table of current notebook processors shows how our test model performs in comparison to other processors. The subjective system performance was decent during our test. Even during multi-tasking, the test model had always sufficient free resources for starting further tasks. But, users who are used to an SSD will notice a difference to the SSHD used here. PCMark 7 confirms our subjective impressions. Since PCMark 7 favors SSDs, our test model achieved for example a 40% lower score than the MSI GP62. However, it is very strange that an actually weaker equipped Toshiba Satellite P50 performs slightly better than the HP Envy 15. This could be due to problems with the CPU clock rates. We will analyze this issue in detail in the coming sections. The 1 TB hard drive with 8 GB cache offers enough storage capacity. The 2.5-inch drive achieves good read and write rates of above 110 MB/s. Unfortunately, the manufacturer does not offer an SSD option. In comparison, the MSI GP62 uses a 512 GB SSD, which achieves almost five times higher read and write rates. SSDs especially bring much higher 4K values, which are particularly important. The graphics hardware is probably the biggest difference to the Envy 15 from the first quarter of this year. HP incorporated an Nvidia GTX 950M in our test model. The dedicated graphics card ranks in the upper mid-range. Our model competes with 4 GB video RAM and a core clock of 1000 MHz. It achieves almost 3300 points in 3DMark 11. It is very strange that the MSI GP62 achieves 1500 points more, but also other devices with GTX 950M and 850M are clearly ahead. We tred to understand the problem by looking at the sensors with HWInfo. It turns out that the processor does not use its full potential. On average, the CPU only clocked at 1360 MHz during the test. At the end of the test, the CPU frequency only fluctuated between 800 MHz and 1.2 GHz and the CPU temperature was only 58 °C. We recorded a maximum temperature of 78 °C. We cannot say whether our test model is defective. In any case, the actually more powerful GTX 950M model performs worse than the already reviewed GTX 850M model. HP CoolSense was always disabled during our tests. This programs controls performance and fan speed depending on the settings. The situation also did not improve with active CoolSense software. Further comparisons to each graphics unit are available in our technology section. A lower result in 3DMark is not a problem. The performance in real-world gaming tests is more important. 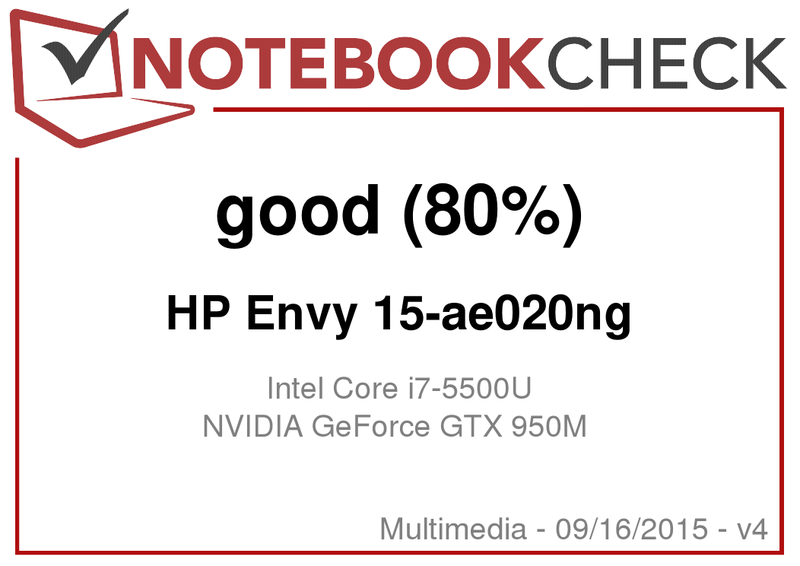 Unfortunately, the Envy 15 test model remains more or less clearly below the expected performance in all tested games. In addition, we could observe that the performance gets worse the longer the test, for example, in Watch Dogs. As can be seen in the analysis diagram below, our test model remains constantly at a comfortable noise level. 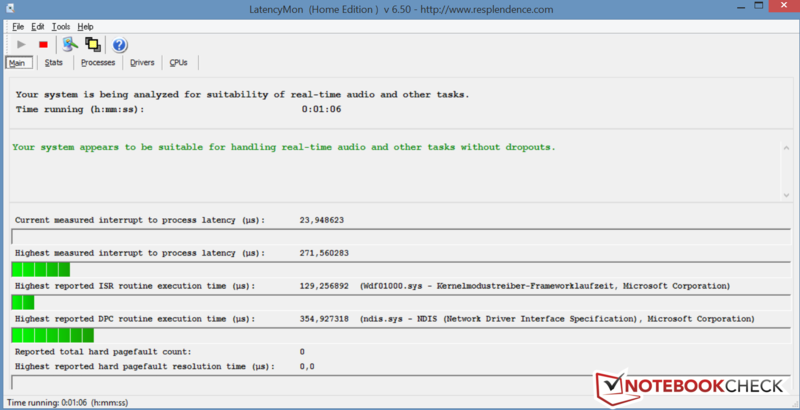 With enabled HP CoolSense, the device is almost silent while idle. Fan noises are only audible while idle when we force using the dedicated graphics card in the energy settings. Under load, the system noise increases to up to 42 dB(A), while the average noise level is 37.2 dB(A). The frequency range of the fan is not disturbing. The noise is rather dull and only gets slightly high frequent under full load. The manufacturer influences the heating in two ways. The first is the design of the case. Thanks to the sophisticated display hinge, there is more space for air under the base unit compared to other devices. Furthermore, the included HP SenseCare program ensures that the device does not heat that much on a soft surface. The heat dissipation is convincing while idle. The notebook does not get especially warm with a hot spot of 32.6 °C. First under load high temperatures of up to 52 °C are possible. The maximum temperature is reached on the underside. These temperatures develop during permanent full load. However, we could also observe high temperatures in the keyboard part during our gaming and graphics benchmarks. But, it was still possible to work with the notebook and type. The included power adapter reached temperatures between 36.6 °C (idle) and 47.8 °C (load). Thus, you should not cover it with blankets or pillows. We check the core temperatures under extreme conditions with our stress test. For this purpose we run FurMark and Prime95. The processor already reaches a temperature of 96 °C after a few minutes and has to work at its base clock afterwards. Thus, it only clocks at 800 MHz almost from the beginning. We rerun 3DMark 11 after about an hour stress test. The score is almost identical to the cold start's. It should be noted again that throttling also occurred during 3DMark 11 without stress influence. Our test model houses four speakers and a subwoofer. Bang & Olufsen offers several base settings for software sided sound configuration. After several manual adjustments, the sound is quite decent. Unfortunately, it still lacks volume. In addition, we expected more from the basses. Overall, the integrated speakers are sufficient for film evenings and YouTube videos. But, you should use external devices to really enjoy music and sound. The 15-inch all-rounder is not especially power hungry. 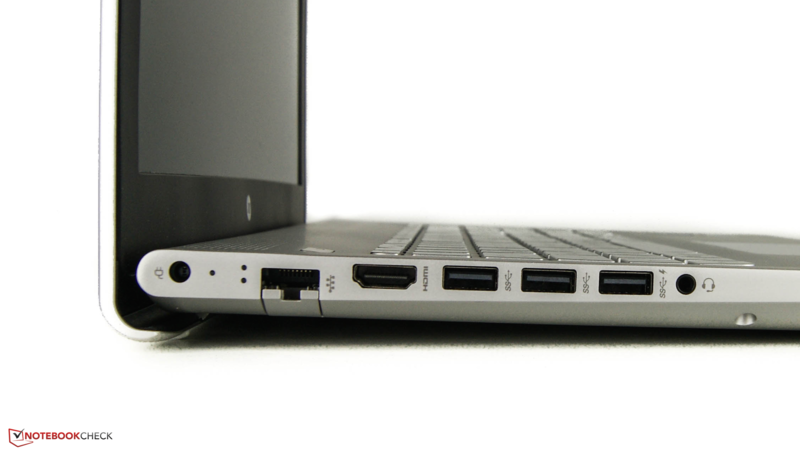 With a power consumption between 4.1 W and 9.2 W it even requires less energy than the Envy 15 with weaker components. Under load, the power consumption increases to up to 42 W. The low energy requirements once again hint on the previously detected throttling. The Envy 15 with Nvidia GTX 850M already required a maximum of a high 67.3 W.
Our test model uses a battery with a capacity of 55.5 Wh. The 3-cell battery has to prove its performance in a realistic scenario. 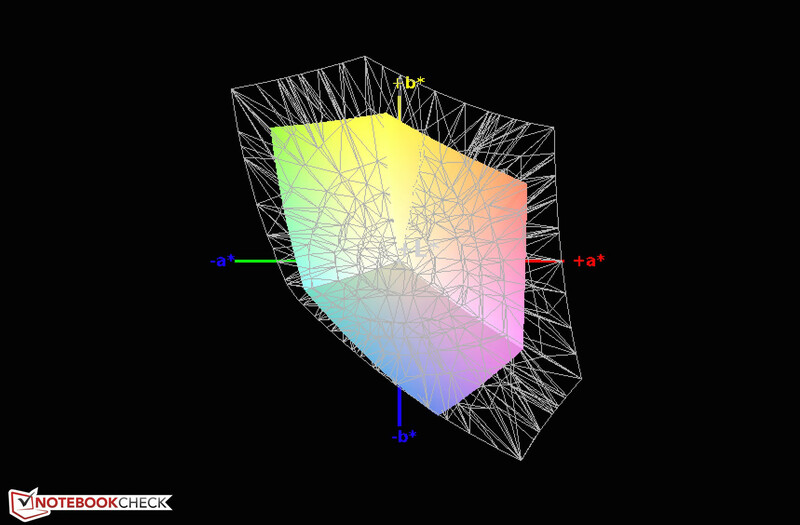 Thus, we simulate web surfing with a brightness of about 150 cd/m². The HP Envy 15 shuts down after slightly more than 5 hours. Hence, the battery life is not sufficient for a whole day, but longer film evenings or surf sessions should be possible without problems. The MSI GP62 is a negative example. It just lasts about 1.5 h without power connection. In review: HP Envy 15-ae020ng. Test model provided by HP Store. 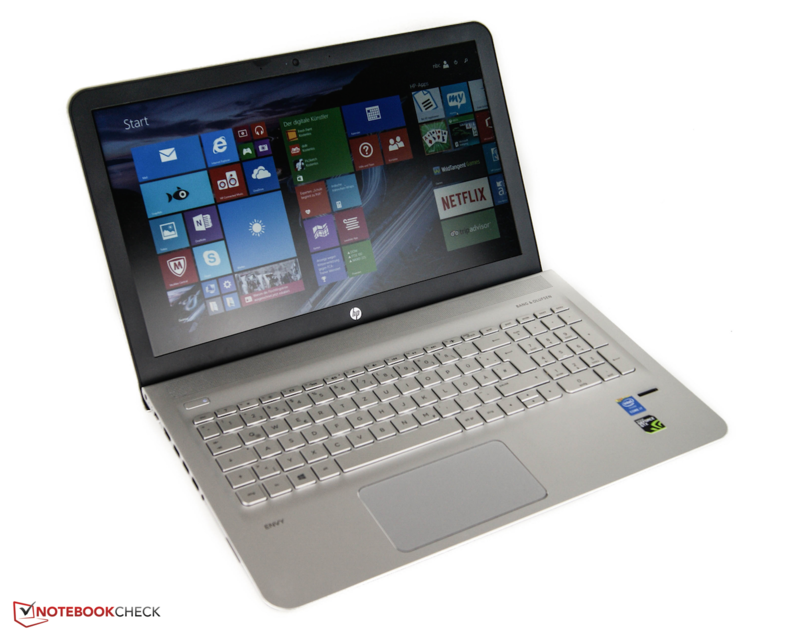 The HP Envy 15 appeals with its high-end design. Despite good materials, we could find flaws in build quality in some spots. The all-rounder aims to balance office and multimedia capability. For this, the input devices are an important criterion. These are generally convincing. The keyboard is even apt for longer office work. Regarding inner components, mainly the graphics unit changed compared to the predecessor. Unfortunately, the CPU throttles in our test model, which gets especially apparent during games, where the Envy 15 falls significantly behind the expectations in comparable equipment. Currently, we cannot say whether the problems are limited to our test model. Unfortunately, the inner values of the Envy 15 do not meet the promising look. Apart form this big point of critique, the 15-inch notebook delivers a good battery life of above 5 h. Users who consider performance more important than mobility could, for example, consider the MSI GP62. Acer's Aspire Nitro V15 scores points with a significantly better display.